The U.S. Institute of Peace has a great name, our tax dollars, and a terrible record. Let's move it in a better direction. If you've never heard of the U.S. Institute of Peace, please keep reading. It works everyday with your money in a fancy new building next to the Lincoln Memorial in Washington, D.C. It just doesn't work for peace. If you know the USIP's record and consider it a lost cause, please keep reading. This institute can be made to do some good. A number of us will be meeting with USIP in late September and bringing along this petition. Please click here to sign it. 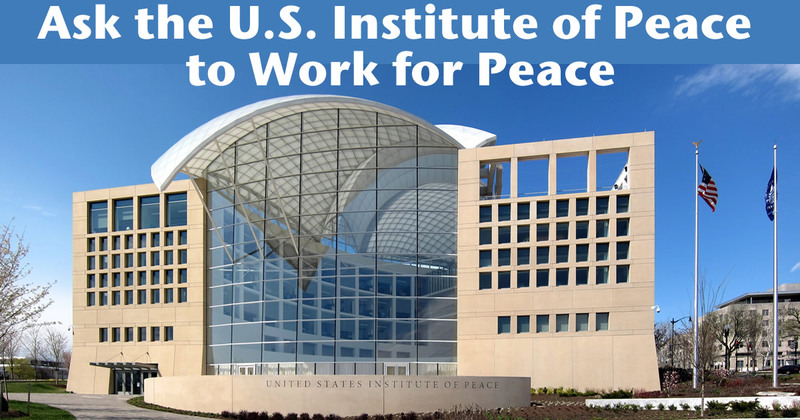 The petition to USIP reads: "We urge you to oppose U.S. militarism and begin working for an end to U.S. war-making by providing to Congress and the public information on the disastrous results of recent U.S. wars and the superior results of nonviolence and diplomacy. We ask that you recommend to the President of the United States the removal from your board of Stephen Hadley, Eric Edelman, and Frederick M. Padilla, and their replacement by three seasoned peace activists, along with a recommendation to maintain at least three seasoned peace activists on your board at all times -- right now there are none." The U.S. Institute of Peace is a federal government institute created by a bill signed into law in 1984 by President Ronald Reagan and funded annually by Congress as well as sometimes receiving funding from the Department of State, the U.S. Agency for International Development (USAID), and the military. The law states that the "Secretary of State, the Secretary of Defense, the Director of the Arms Control and Disarmament Agency, and the Director of Central Intelligence each may assign officers and employees of his respective department or agency, on a rotating basis to be determined by the Board, to the Institute." The Institute has never opposed a U.S. war and claims that it can only support things, not oppose them. But in fact, the law only forbids it from seeking "to influence the passage or defeat of legislation " except that the personnel of the Institute may testify or make other appropriate communication when formally requested to do so by a legislative body, a committee, or a member thereof." Most U.S. wars, including the war on Libya, the newly revived war on Iraq (and Syria), and the drone wars on Pakistan, Somalia, and Yemen, have been launched without legislation. And, even if there were legislation involved, it would not be at all difficult for USIP to ask a single member of Congress to request its opinion, thereby freeing it to provide its views and its research. USIP makes no claim that it cannot provide the public with information on the negative results of U.S. wars; it simply fails to do so.